As the Bowl season gets under way, lets take a look back at our rankings back in September of quarterbacks and running backs who could be in the 2011 draft. Some guys, like Case Keenum, would have fallen off a lot. In his case, its due to injuries. Others lived up to the hype and in some cases have moved way up the draft charts. We’ll also take a look at some players at both positions who have moved into the top 10 and up in the draft. Analysis: Locker had a decent, but not great, year and Luck has clearly surpassed him and is the number one quarterback in the draft if he comes out. You can watch highlights of Locker and see how he athletic he is in this video clip. Mallett probably surpassed him as well with an excellent year. Locker is a good athlete but may have slipped down to the bottom of the first round or even second round. Luck, the son of former NFL quarterback and current West Virginia Athletic Director Oliver Luck, could go number one overall if he comes out, though if Carolina has the pick perhaps they stick with Jimmy Clausen and look elsewhere. You can get a look at Andrew Luck highlights here. 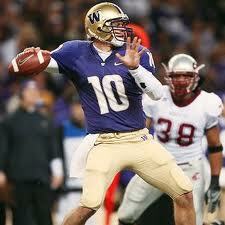 Ponder had a good season and at times looks terrific. He can be a bit inconsistent. It seems unlikely Pryor comes out. Keenum got hurt with a torn ACL and only played in 3 games. He tried to get another year of eligibility but was denied. His draft stock has been hurt, but he would be good late value for an NFL team willing to wait while he rehabs his knee. McElroy is a winner who will make a nice third round pick to develop for some team. Johnson got benched late in the year and Texas A+M got hot afterwards. Reportedly he took it well and is a team player with good character. He also is a top-flight athlete so is still draftable late. If we had to do the list again, Rick Stanzi from Iowa would probably creep into the list and is certainly draftable. He’s smart, only threw 4 INTs all year and there is a tie to the Patriots as Iowa coach Kirk Ferentz is a close friend of Bill Belichick and former assistant to him. Delaware QB Pat Devlin will likely be a mid-round choice and has lots of potential. He was originally at Penn State before transferring to Delaware. You can watch some highlights of Devlin in this video link. TCU quarterback Andy Dalton is a winner with limited skills, but smarts and could make a good NFL backup. Of course Cam Newton from Auburn has to be mentioned. The Heisman Trophy winner could come out with all the controversy that swirled around him. And we do know being paid to be football would please his family. He has tremendous skills. The running, size, arm and strength are all top notch. But he could use another year of experience. If he comes out, his talent will get him drafted high. Analysis: Thomas is not the top runner according to many, though in the top 5 in most opinions. I like him because his size-speed combo translates to the NFL, along with his excellent power. But there is some bust potential there as he disappears at times. I chalk that up more to playing for a middling team. You can see some excellent highlights of Thomas in this clip. Ingram had an up and down year and started out injured. The 2009 Heisman Trophy winner remains a great prospect, but is perhaps towards the back end of the first round now. Some have Murray as the top back in the draft and he is perhaps the most well-rounded. He’s a good player. Saine had a very disappointing year and didn’t even get the majority of snaps for OSU. He’s a late round project despite great talent. Something is missing. Many like Devine more than me and while he is electrifying, I see him as a third down back and perhaps not even as good a one as Locke. Others who’ve slipped into the conversation are Mario Fannin who is a big, talented back from Auburn who had limited playing time as the Tigers used a younger, top recruit as their main back. Fannin has played some receiver and is good in the passing game, but also has great power and running skills as a back. Kendall Hunter from Oklahoma State is a bit undersized, but has good speed and elusiveness. You can see some sweet highlights of Hunter here.